More than 200 people turned out for the signing of a new cookbook that honors the talent and memory of the late Chef Chip Sears. The book, From Chef Chip’s Kitchen, was written by Kaye Sears, his mother, and Chef John Bennett, his uncle. Chip passed away June 14, 2010, after being injured in a motorcycle accident near Lake Tenkiller during the previous Memorial Day weekend. The event was more than the celebration of the life of a well-known chef. It was also a sampling of some of the recipes featured in the 148-page book. Chef John Bennett prepared several of the recipes for the culinary enjoyment of the large crowd. The savory fare included chilled avocado-cucumber soup, hot butternut jalapeno soup, croutons, pumpkin bread and chocolate sheet cake. Chef Bennett dressed the book signing table with fresh flowers and a pumpkin carved with Chip’s logo. Dr. Gary Brown helped with the food at the signing. He was instrumental in getting the book project off the ground because he had saved all of Chip’s recipes from the culinary classes Chip taught. Also special was the presence of Chip’s daughters, Olivia, nine, and Isabelle, 12. Both are students at Casady School, where their grandfather, Glenn Sears, was a coach for 35 years. The book is filled with recipes that were favorites of Chip’s, as well as numerous photographs that reflect Chip’s love for his family. Proceeds from the book sales will benefit Olivia and Isabelle’s education fund. 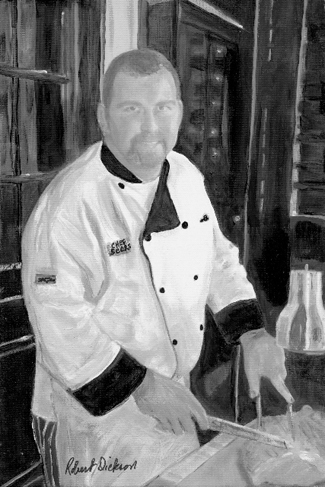 Chip was a popular local chef, having worked at The Metro, Nonna’s Painted Door and Platt Culinary College. Eventually he branched out on his own and created “The Chef’s Kitchen,” which offered cooking classes, weekly specials and a variety of take out specialties. He always attributed much of his skill in the kitchen to his uncle, John Bennett. But even as a four-year-old, Chip had the makings of a chef. One of the first dishes he created was what he called “Egg In A Hole” ~ a poached egg in the center of toasted bread. After he graduated from Northeastern State University in Tahlequah, he became a sous chef for John and they cooked together almost daily as Chip was learning how to become a master chef. A 1994 summer trip to Europe was like the icing on a cake for Chip. Having tasted some of the world’s best food, he was eager to return home and begin a three-and-a half year apprenticeship with his uncle and culinary mentor. One of the highlights of Chip’s career was cooking at the James Beard House in New York City. He and John were invited to prepare a dinner there in August of 2002, and again on the occasion of Beard’s 100th birthday anniversary. With 23 other chefs, they prepared a tasting menu for 500 of the nation’s top food and wine professionals ~ an event that is still considered the Oscars of the culinary world. The Metro Wine Bar and Bistro patrons still savor three recipes he created ~ chilled avocado-cucumber summer soup, his famous crab cakes and butternut squash soup ~ a perfect autumn selection. The book includes sections on soups, salads, dressings, main dishes, sides, sauces, seasonings and relishes, breads and desserts. Of particular interest is a section on Sears’ family recipes, especially Chip’s Onion Soup, Grandmother Sears’ Hamburger Stew, Chili, Coach’s Pot Roast, King Ranch Chicken, Kaye’s peanut brittle and Aunt Verna’s Rum Cake. Mama Bennett’s four-layer coconut cake is prominently featured in the family section, including a hand-written note from former First Lady Laura Bush, thanking John and Chip for the cake recipe, and the gift of a collection of dessert plates from the James Polk Presidential administration. Recipes for Christmas no-bake cookies, truffles and fudge are highlights as well. The six-page glossary is also spiced with a variety of photographs.